Last week I examined the Obama administration’s claims that the Affordable Care Act was responsible for 4 million Medicaid enrollments in October and November. I concluded that these numbers were off, and badly so. At the same time, I made clear that my estimate of 200,000 actual new enrollees was just an estimate, and could be off by a substantial amount. I suggested, somewhat arbitrarily, doubling that number to 400,000 for what I thought would be a generous estimate of how many “newly eligibles” signed up for Medicaid due to Obamacare in October and November. The second issue is that of those 1.9 million, some would have enrolled (or re-enrolled) in the program under the pre-expansion rules. Every state had a Medicaid program in place prior to the expansion, although the eligibility level varied widely from state to state, and therefore would have signed up people in the program absent the new funding. Looking at the changes in the application rates between states that undertook the expansion and those that did not, I estimated that around 200,000 of those applicants were newly eligible under the Medicaid expansion. Today I want to take a slightly different look at these data, focusing on the great state of Arkansas. Arkansas is interesting -- it agreed to the expansion, but rather than placing its newly eligible population on the traditional Medicaid program, it instead offered them private insurance. As part of the agreement with the federal government, it agreed to track how many of its applicants were, in fact, newly eligible under the expansion. This gives us firmer data than we have for the states as a whole. It isn’t perfect, for reasons we’ll get into later; for now just trust me that it provides a sort of “best case” scenario for the expansion numbers. But it allows us to get at our estimates from a different angle. According to my knowledgeable sources, just under 70,000 newly eligible people enrolled in Medicaid through the end of November in Arkansas. Again, we are pretty certain that all of these enrollees were not previously eligible for Medicaid, and are wholly attributable to the state’s expansion. If we look at the overall enrollment numbers supplied by the state to CMS, 103,000 people were determined to be eligible for Medicaid in October, while another 37,000 were determined to be eligible in November. So we have 140,000 new enrollees overall. But we also know that the state numbers were just estimates -- the initial estimates for October grew by another 50 percent by the time the November numbers came out. But we’ll be very cautious here, and assume that another 20,000 were found eligible for Medicaid in Arkansas in October by the time the numbers were finalized. This suggests that if there were 160,000 new enrollees in Medicaid in Arkansas in October and November of 2010, about 44 percent of them were eligible due to the expansion, while 56 percent were enrolling under the old rules. Now remember, of the 4 million enrollees that the administration claimed were due to the Medicaid expansion, only 1.9 million were in states that expanded Medicaid in the first place. If we assume that 44 percent of these enrollees were eligible under the new rules, that gives us an estimate of 836,000. That’s a lot more than my initial estimate of 200,000, but it is still only 21 percent of the number indicated by the administration. But Arkansas is something of the best-case scenario for the expansion. It’s highly unlikely that 44 percent of the Medicaid enrollees were due to the ACA expansion in any other state. We have to understand two things about Arkansas. First, it undertook an aggressive outreach program, mailing everyone on SNAP (a.k.a. food stamps) to inform them about the new eligibility cutoff. So it would be more likely to attract newly eligible enrollees in the first place. The median state that expanded Medicaid already covered eligibility up to 106 percent of the federal poverty level for families. Arkansas, by contrast, weighed in at 17 percent, although with respect to poor, non-disabled adults, it is at the median -- zero percent coverage. So when Arkansas expanded eligibility, it created a newly eligible category that covered working families earning between 16 percent and 138 percent of the federal poverty level. The only other states that came close to undertaking this sort of expansion were West Virginia and Oregon. When California expanded eligibility, because its baseline was so high to begin with, it only did so for families making between 106 percent and 138 percent of the federal poverty level, although it let in a large number of non-disabled adults. Because of this, newly eligible people in California almost certainly make up a much, much smaller share of the October/November enrollment numbers than they do in Arkansas. Moreover, most of the really big states that expanded eligibility -- New York, Illinois, California, and Ohio -- already had relatively generous Medicaid programs to begin with. “Newly eligibles” simply aren’t going to be as big of a share there as they were in Arkansas. To put this differently, there were an estimated 218,000 newly eligible folk to be enrolled in Medicaid in Arkansas -- people who made less than 138 percent of the poverty level. That’s 600 percent of the previously eligible 36,000 adults -- a massive expansion (although remember that adults are only a portion of the total people eligible for Medicaid). Therefore, we’d expect newly eligibles to be a large share of the October/November enrollment. The state of New York, by contrast, has seven times the total population, but the expansion of Medicaid actually created fewer newly eligible adults: 170,000 newly eligible adults. Given that there were 641,000 previously eligible adults, we’d expect “newly eligibles” to be a relatively small portion of enrollment on October and November. It’s very reasonable to assume that Arkansas’s “44 percent” is the upper boundary of the share of Medicaid enrollees in October/November that were newly eligible. 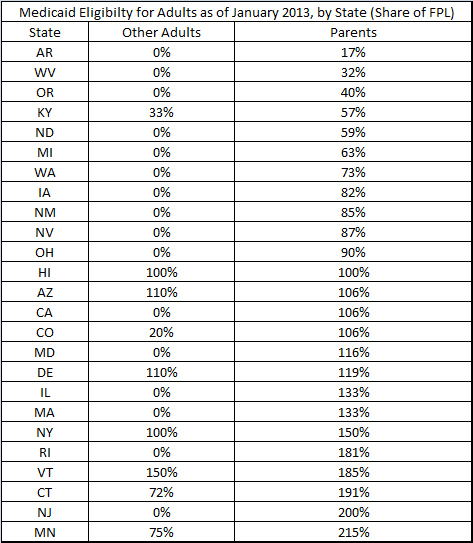 How much lower is the rate for states that undertook the expansion? It’s tough to say, though again, given the base line in states like New York and California, it is almost certainly quite a bit lower. We doubled my initial estimate to get to 400,000, which I thought was being generous to the administration. Let’s say here that we halve our estimate. There’s actually something to be said for this approach. Among adults, new enrollees in Arkansas are eventually expected to make up 600 percent of the population, vis-à-vis previously eligible adults. But in the average state expanding Medicaid, weighted by population, new enrollees are eventually expected to make up a little more than half that share, about 350 percent of the population. So if newly eligible enrollees account for 44 percent of the October/November enrollees in Arkansas, 22 percent in the expansion states as a whole seems like a reasonable -- if imperfect -- estimate (especially after we account for Arkansas’ aggressive outreach). So around 400,000 seems like a reasonable number to use here. This is still a significant expansion of coverage, and I suspect this number will grow considerably as the exchanges continue to improve and as we reach the deadline for the individual mandate. But it’s nevertheless well below the number the administration is suggesting.